Here at Windsor Fish Hatchery, we pride ourselves on the pond fish that we breed. 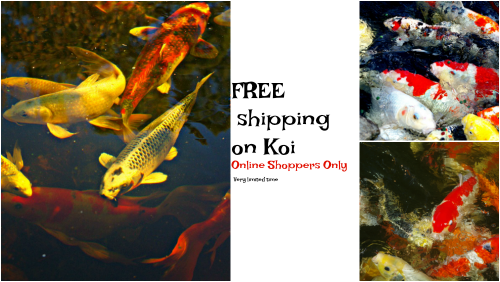 We are a licensed hatchery and this means that we breed all the Koi that we sell along with all our other pond fish. We can guarantee that no Koi are brought in from any other hatchery or other location. In addition, any Koi that are sold and have left the hatchery cannot be returned. This helps to significantly reduce the risk of infection and maintain the health and wellbeing of our stocks. We firmly believe that this is in our customers’ best interests. The wellbeing of all our pond fish is important to us, even when they are in transit. We guarantee that your fish will be alive when they reach you, a guarantee that we are very proud of. Find out how live fish shipping works here, this is VERY IMPORTANT reading if you haven't bought fish online through our store before. Not only are our pond fish available online, we also accept orders via telephone if you call 0432 790 703. Sadly, and only in very rare circumstance, fish can die during shipping and this is usually down to natural causes. If this is something that you have experienced and you have not yet opened the bag or let the fish into your aquarium or pond, we will refund you the cost of the dead fish only (DOA). 1. Take a clear photo of the dead fish inside the bag showing that the bag is still intact and has not been opened. If you would like more information about our pond fish we would invite you to call us on 0432 790 703, email on info@windsorfishhatchery.com.au or alternatively, you can contact us via our website.